Caron Chiropractic Clinic, PA, provides our patients with the best non-invasive and permanent pain relief. This is built into our mission and it is an essential part of the training our staff receives to prioritize non-invasive and permanent pain relief. The essence of chiropractic medicine; in fact, is to encourage the bodyto use its own healing powers. Our trained and experienced staff uses safe and effective techniques based on research and ongoing study of the art and science of chiropractic care. Many health issues can respond well to chiropractic care. The issues that most often come to mind include back injuries (from auto accidents, falls at work, and the like), carpal tunnel syndrome, arthritis, and the treatment of migraine headaches. It may not be as widely known, but chiropractic medicine can also be an effective treatment for allergies, fibromyalgia, temporomandibular joint (TMJ) issues, and sleep disorders. As you can see, we have a treatment arsenal that can work wonders on a wide range of health concerns. The care we provide our clients is comprehensive and non-invasive. We work hard to establish trust with our clients, and from that trust comes the possibility of solving your health issues permanently. You can visit Caron Chiropractic periodically, when issues arise for you and we will provide non-invasive treatment that offers immediate relief. 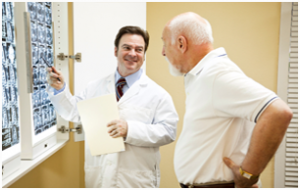 Many find that coming to see our team regularly offers subtle and more long-lasting relief from chronic pain. We will meet you where you are and develop a treatment plan that works for you. Many chiropractic practitioners offer non-invasive care. Our team stands out because we operate from a mission statement that seeks to make your chiropractic issues disappear permanently. We make this commitment because we understand that strong chiropractic care is not merely transactional. We do not sell our chiropractic treatments like goods on a shelf in a big-box store. We partner with our clients to listen and return them to optimal health. When our professional expertise combines with a positive, trusting relationship, you will find yourself one step closer to permanent relief from your present discomfort. To schedule an appointment with the team at Caron Chiropractic Clinic, call (651) 255-9999. This entry was posted	on Saturday, January 12th, 2019 at 11:27 pm	and is filed under Chronic Pain, Pain Relief. You can follow any responses to this entry through the RSS 2.0 feed. You can leave a response, or trackback from your own site.